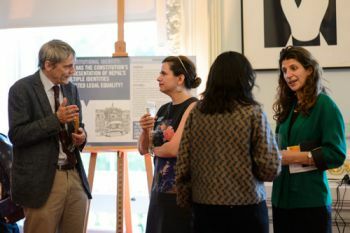 Lecturer in The City Law School, Dr Mara Malagodi, exhibited her findings during the June 2016 soiree of the UK’s distinguished body for humanities and social science scholarship. Dr Mara Malagodi showcased her insights into Nepal’s constitutional identity during the British Academy’s soiree, held in Central London on 28th June 2016. The event, involving pop-up talks, interactive exhibits and outdoor performance workshops, celebrated and promoted the cutting-edge academic research of the British Academy Fellows. Dr Malagodi was awarded a British Academy Postdoctoral Fellowship to investigate the enduring patterns of social exclusion of Nepal’s marginalised groups in the constitutional arena after the re-democratisation of 1990. Her Fellowship commenced in 2012, while she was a researcher at the London School of Economics. 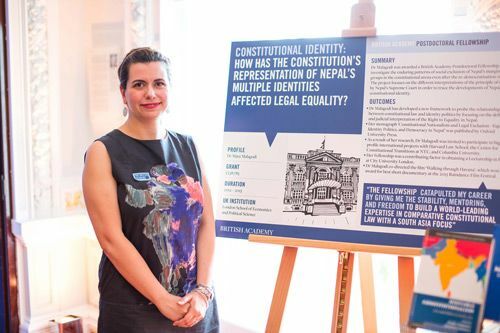 Her project focuses on the different interpretations of the principle of equality by Nepal’s Supreme Court in order to trace the developments of Nepal’s constitutional identity. Dr Malagodi has developed a new framework to probe the relationship between constitutional law and identity politics by focusing on the definition and judicial interpretation of the Right to Equality in Nepal. Her monograph, ‘Constitutional Nationalism and Legal Exclusion - Equality, Identity Politics, and Democracy in Nepal’ was published by Oxford University Press. As a result of her research, Dr Malagodi was invited to participate in high profile international projects with Harvard Law School, the Centre for Constitutional Transitions at NYU, and Columbia University. Her Fellowship was a contributing factor in obtaining a Lectureship in Law at City University London. Dr Malagodi co-directed the film ‘Walking through Havana’, which won the award for best short documentary at the 2015 Raindance Film Festival. Social exclusion involves the lack or denial of resources, rights, goods and services, and the inability to participate in the normal relationships and activities, available to the majority of people in a society, whether in economic, social, cultural or political arenas. It affects both the quality of life of individuals and the equity and cohesion of society as a whole.